New OEM replacement IR remote control fits for Roku TV with 4 shortcut keys e.g. NETFLIX AMAZON SLING. Compatible with these remote models RCRUS-17 and RCRUS-18. Standard IR Remote, NO pairing. Use 2x AAA batteries, NOT included. Standard IR Remote, NO programming, NO pairing. NOT Compatible with ROKU STICK or ROKU PLAYER. 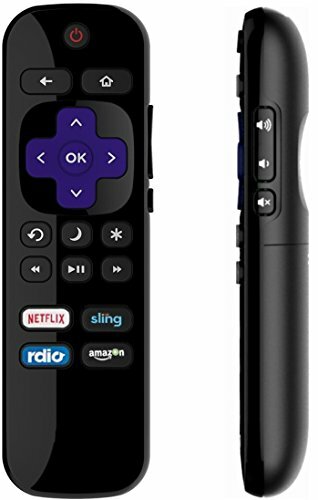 OEM Standard IR Replacement Remote fit for Roku TV with supports of various APPs like Netflix AMAZON Sling HULU HBO NOW Spotify Pandora CBS YouTube Fandango Crackle Starz Showtime Directv NOW Google play Vudu VUE, and much more. For Smart TVs with BUILT-IN Roku function. If you have any questions about this product by IKU, contact us by completing and submitting the form below. If you are looking for a specif part number, please include it with your message.